President Kling’s first meeting with (from left): Jack White, Logan Anderson, Zach Brister, and Jacob Touchstone. During a visit last year with a head of school in another state, my colleague shared that he meets with all of his school’s seniors in small groups. I decided then that I would create a similar practice at Jackson Academy. I look forward to meeting with our seniors to ask for their reflections on the total Jackson Academy experience as they begin to transition from students to alumni. As I thought more about meeting with seniors, I felt it would be a lost opportunity to meet with our students for the first time in the spring of their senior year just as they are about to graduate and leave campus. So I decided to meet in the fall with our sophomores to strengthen my relationships with them – relationships that will continue to be nurtured over the next two-and-a-half years. And when those same students come to my office for the meeting in their senior year, they will be returning to a familiar place with the knowledge that their opinions and thoughts matter not only as “almost” alumni, but also during their Upper School years. 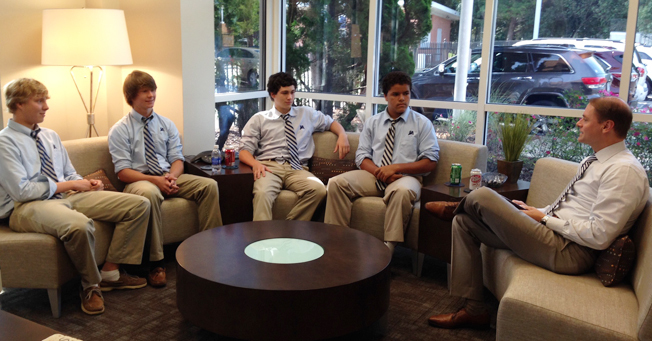 I embarked on meeting with all of our sophomores in groups of three to four students. The first meeting was held on September 15, and I just completed the last meeting this past Thursday. Each meeting lasted about 50 minutes, and as the above photo shows, the atmosphere was relaxed, casual, and welcoming. One of the fun things to see was how the different groups responded when I offered them soft drinks upon entering my office. Some accepted the offer immediately and chose their beverage. Some of the groups were shy at first with everyone saying they didn’t want a drink until finally one student would relent and tell me his or her choice for a drink and then, with the ice broken, everyone else would follow suit. even more importantly, good kids. 2. What classes do you love and hate most in school? Why? 3. Describe your favorite teacher. What about that teacher makes him or her your favorite teacher? 4. If school could be about any one thing, and it was your job to design all the subjects around that one thing, what would you want it to be and why? 5. If you had a choice to come to school, would you come? Why or why not? 6. What are your greatest talents? If I needed your help to do something, what would it be? 7. Do you like group work or individual work? 8. If you could be president of JA for a day, what one thing would you change? 9. What colleges are you thinking about attending? 10. What careers are you considering? I couldn’t possibly report on all of the responses from each of the students, but a few themes certainly emerged. One is that our students have a wide range of interests that they pursue both at JA and beyond. Another is that if these students are any indication, network and cable television is in trouble in the future as they don’t watch TV. Instead, if they watch organized programming at all, they watch it on Netflix on demand and on their schedule. Thankfully, every one of our students said that they would still come to school if given a choice. However, some said they would come fewer than five days a week, and many said they would come later in the morning. One of the most touching moments during my meetings came in response to the question asking what is your greatest talent. A group of four girls thought about it for a moment and then proceeded to answer with three of the girls collaborating in the most sincere and heartfelt way to tell me the greatest talent of their classmate. They did this for each of the four students, and then I had to apologize for needing to wipe tears from my eyes. It was incredibly touching to see these girls affirm and uplift each other by sharing the special gifts and talents of each of their friends. The students seemed to have fun with the question about being president of JA for a day. I was both surprised and pleased that several of the groups had to really struggle to come up with something that they would like to see changed. The common suggestions that emerged included adding more student parking, beginning school at a later time, providing better food in the cafeteria, and modifying the uniform policy to allow more shoe and outerwear choices. The discussions proved to be incredibly rewarding and quite informative for me. Best of all, the students seemed to genuinely enjoy our meetings, and many expressed appreciation to me afterwards for meeting with them. Every one of the students opened up and discussed their thoughts, opinions, and ideas quite freely. The meetings have allowed me to get to know our students better and to understand their experience at Jackson Academy more fully. I look forward to continuing to nurture and grow the relationships with our students formed through these meetings. Having spent this time with each of our students, I am so impressed with them. We are truly privileged to have the opportunity to serve such great students—individuals who are not only good students, but, even more importantly, good kids.